The Wanderers Under 19's Youth Team have missed out on qualifying for the top division in this season's Football League Youth Alliance merit matches. Brentford's 4-0 victory over Southend on Monday (18th February) means that Wanderers can now only finish in a mid table position in the South East Conference and they will now play in the 'Division Two' section. There opposition will be Bristol Rovers, Cardiff City and Plymouth Argyle from the South West section, Rushden, Luton Town and Northampton from the South Central section plus Portsmouth and Leyton Orient from Wanderers own South East section. The Under 19's play their final South East Conference game of the 2001/2 season on Friday 22nd February when Brentford are the visitors to Molins Sports Ground (KO 12 noon). The merit division matches begin the following week on Saturday 2nd March. The Under 17's play their final home Youth Alliance fixture of the season on Saturday 23rd February when they take on Peterborough United at Molins (KO 11am). The Wanderers are fielding a number of schoolboys and triallists in preparation for announcing who will be awarded scholarships starting next season. Recent traillists have included Nick Beasant (Dave Beasant's son) and Tommy Nutter, the younger brother of former Wycombe player John Nutter. The latter player has been playing for Burnham recently and has been catching the attention of several clubs. The Wanderers Youth Team play their home League games at Molins Sports Ground in Princes Risborough. Admission is FREE and a programme is produced for all Under 19 fixtures. 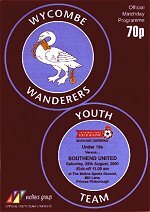 The programme won the Wirral Programme Club Youth Team Programme of the Season for 1999/2000. 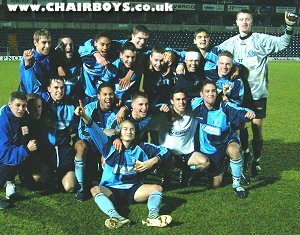 © Chairboys on the Net 2002 - all rights reserved.